Wanted severe reparations paid. Reparations was a french idea, punishing economically. Meaning damage created in a war has to be paid for. They wanted to set it so high so the German economy would collapse. View Georges Clemenceau and over 3,000,000 other topics on Qwiki. "A man who waits to believe in action before acting is anything you like, but he's not a man of action. You must act as you breathe"
Summary: From Georges point of view he has witnessed 8 million lives lost to the war and 300 000 houses damaged. His goal was to ensure France was safe from any further attack. 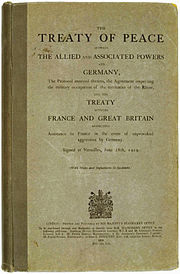 His demand was for the Treaty to make sure Germany was weakened as much as possible, ultimately crippling them. He clashed with Woodrow Wilson as he believed the USA had not suffered nearly as much.